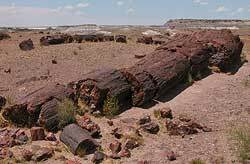 The Painted Desert in Arizona contains an invaluable record of Triassic plants and animals. Most people think of the Great Extinction as what eventually wiped out the dinosaurs, but this event is what started the dinosaur age and is considered the greatest extinction in earth's history. This extinction at the end of the Permian age wiped out more than 95 percent of all marine life and approximately 70 percent of land life including insects. This left the earth nearly barren and ripe for evolution. This also contributes to the dinosaurs becoming the dominant race on the earth at that time. This is one of the reasons why population started slow and did not begin to flourish until the end of the Triassic period. At the beginning of the Triassic period, all of the continents were joined as one, Pangaea. The continent was surrounded by a huge ocean called Panthalassa. Although the continent did not split during the Triassic, rifting had begun, especially by the late Triassic. The environment of the Triassic period was generally warm. Polar ice caps did not yet exist and the difference in temperature between the poles and the equator was much less graded than it is today. The continents were still connected as one, which caused desert environment to prevail near the center regions of Pangaea. This made it difficult for life to exist in the center of the continent, which is why most dinosaurs and other life forms lived near the seaboards. On a geological timescale the Triassic period is noted as having a large lack of coal. This contributes to the idea that life was scarce and that barely sufficient plant life would later be compressed to form coal. At the beginning of the Triassic period the race that had dominated the Permian period, Synapsids, slowly gave way to the Archosaurs, the early ancestors of dinosaurs. Dinosaurs eventually evolved in the late-Triassic along with crocodilians, pterosaurs (flying reptiles), and other sea-reptiles and mammals. Some of the earliest discovered dinosaurs were the Herrerasaurus and Eoraptor both of which were bipedal hunters. Dinosaurs are found in many locations, but numerous fossils are found in South Africa, one of the most fertile areas during the Triassic period. The Triassic period ended with a mass extinction that killed off much of the marine life and several clades of dinosaurs. However, many species of dinosaurs lived to evolve in the Jurassic period. The cause of this mass extinction is debated but may be linked to some of the largest volcanic eruptions since the cooling of the earth, instigated by the separation of Pangaea and plate shifting. Due to this extinction the dinosaurs that remained began to evolve and become even more the most dominant species on the earth.